Blaine: 00:00 Okay. How do we start this? Welcome to Couple Co.
Honey: 00:03 That's how we did it. Blaine: 00:05 Welcome to Couple Co. 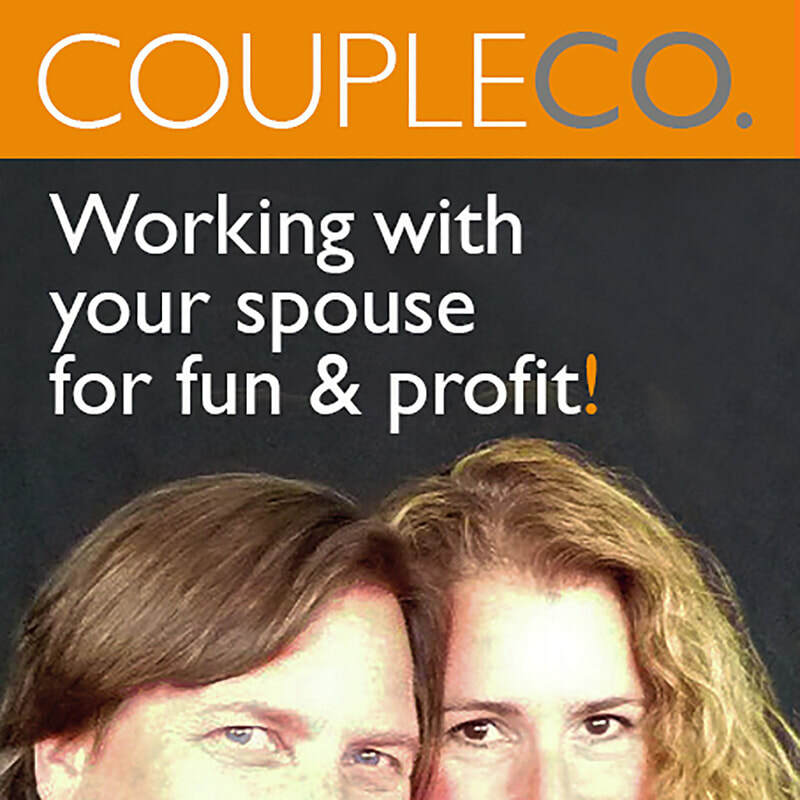 Working with your spouse for fun and profit. Honey: 00:09 It's business and it's personal. Blaine: 00:11 Oh yes. I'm Blaine Parker. Honey: 00:13 So I'm Honey Parker. Blaine: 00:15 Usually. And what do we do here? I don't even remember. Honey: 00:19 We said we've worked together. Blaine: 00:21 We've worked together as a couple co. For 20 years and lived to tell about it. Honey: 00:25 Well, maybe 19 but it's still a lot of time. Blaine: 00:27 Well, you know I figure after ten you just like what's the point in keeping track anymore? But on this show we have decided to hit you up with all kinds of stories from other couple co. Who are crushing it in the 21st century. Honey: 00:40 And it's amazing what you can learn by listening to other people who've been doing what you're trying to do. Blaine: 00:46 Yeah, and it's pretty impressive what some of these couples have accomplished. This show is brought to you by a couple owned business, Smokin' Mary Smoked Bloody Mary Mix. Honey: 00:55 It's made with real whole tomatoes, no reconstituted juice, no extra water, it's just big fat tomato goodness. We are going to be giving you today Jim and Robin Whitney of Whitney Advertising in Park City. This is part two of the interview. If you missed part one it is available for download on iTunes. Honey: 01:19 And part two we get a little deeper into how their couple co. Impacted their kids. Blaine: 01:24 And it did impact the kids. That's for sure. I don't think either of them ever want to be in advertising. Honey: 01:28 Yeah, and I really appreciated how upfront they were about that. Blaine: 01:31 They talk about their immense respect for each other. Blaine: 01:36 And we hit them with the fearsome five lightning round to learn all kinds of interesting things about them and their lives outside of work. Honey: 01:44 It's a peek behind the curtain, behind the Whitney curtain. Blaine: 01:47 Behind the Whitney curtain. So without further adieu, here's part two of Jim Whitney and Robin Whitney of Whitney Advertising in Park City, Utah. Can I circle back to something you said many many minutes ago. Was about the kids. You have breakfast with your kids every day and you had dinner with your kids every day. How did having parents who had their own business affect the kids? Robin: 02:25 They hated it. They hated it. Jim: 02:26 You know I think they really... but we were. At 5:30 we would knock off and we would fix dinner and we'd have dinner. And when they were little we'd get them to bed and then we would go back to work. And we'd work until one or two or three in the morning. Robin: 02:47 Those were the days. Jim: 02:49 But to allow this chunk of time in the evening to be with them and then I sort of shifted the whole schedule and I started going to bed when they went to bed. But I would get up at five in the morning. Robin: 03:06 And that took a full six months. Jim: 03:08 And try to work before they woke up. Jim: 03:13 That's an answer that hasn't evolved yet. It'll be really interesting. We have one daughter out of college and one daughter who's still in college. And in ten years it'll really tell whether what they learned from watching their parents. Blaine: 03:31 Well you certainly don't think they suffered in their childhood. Robin: 03:35 I don't know that they understood what it meant. They're not there. One of them is in college. One of them has just started her career. I don't know that they have had enough life experiences to understand what we chose to do and how it worked. Jim: 03:52 They grew up with it so it all they knew. Blaine: 03:53 Or how those experiences might actually start to manifest. Robin: 03:55 But part of it was, part of that is that when you have that, it's like I said work and life become one. The kids, our work, our projects, I mean the kids knew all of our clients names. Everything we were working on. They knew when we had big meetings. They knew everything about our business. And they still do. They would know, I mean when you have your own business and you don't have a salary. We don't have a salary. We take money out when there's money to take. And we don't when there's no money. Jim: 04:30 We would know nothing about that money. Robin: 04:33 And that's been that way for about 20 years. We haven't had a steady paycheck for 20 years. So their view of our family's finances is affected by these things. Something would happen with our business, we'd start talking about a new name or project, and that was good. We might get a good vacation. Someone went away and fired us and no they might not get the new thing they wanted. And so they became very fluent in the every day reality of entrepreneurship. But also the benefits of it too. And so I think it's true. Who knows what their [crosstalk 00:05:12]. Blaine: 05:11 Do you think you raised entrepreneurs? Jim: 05:15 It's hard to tell right now. Robin: 05:17 It's hard to imagine that we didn't. Jim: 05:18 I think that they both.. I believe that they would both turn out to be. But right now, like our youngest daughter, her whole thing through high school was I'm going to be a doctor because I don't want to go anywhere near a creative field. I don't want anything to do with this. And so I'm going to go into psychiatry. Blaine: 05:38 Oh. Which is its whole other conversation. Jim: 05:43 Yes it is. There were a lot of times we'd be on our way let's say to Salt Lake to an event or something or to meet family. And we'd be driving along and Robin would say oh I just got an email from so and so. And the two, you could hear, it was an audible like ugh from the back seat because they'd know that now all of a sudden this drive down the canyon is going to be a dominant business conversation and we're going to be talking about this client relationship for the next 45 minutes. Blaine: 06:20 Did they ever get enthused by those conversations? Jim: 06:23 No, no they hated it. Robin: 06:28 But they also knew that if we were trying to come up with something, and we didn't have it yet, that whatever that life was then going to be a little bit rearranged to get it. Because we're in the business of ideas and plans. And if we didn't have the idea and plan we needed, then they knew everything stops for that idea to come. And so there were lots of instances, lots, I don't know, didn't happen all the time because we usually get those ideas on schedule. But you know if that meeting is going to happen and you don't have that idea, then yeah, mom and dad are in their pajamas in the kitchen, 5:30 AM sketching and drawing and talking and trying to figure it out. They're still getting breakfast but we're sitting there trying to figure out what that campaign is going to be because we're presenting at 2:00 that afternoon. And everything is it stops until that happens. And so they grew up knowing that if you didn't have the good idea, everything stopped until you got that good idea. Which is an interesting way to raise kids. Blaine: 07:34 Well it's a totally different existence than if you were working at J Walter in New York and raising the kids out in Greenwich. And they never saw you. And they were being raised by the maid. Robin: 07:50 I always thought it was good because in the end the way life works is if you show up with the good idea, yay you. You win. And everything. And you can't just show up with nothing. And so they saw that happen. And maybe that can look painful to kids or maybe it can look exhilarating. Honey: 08:11 But there's also I think there's the bonus of seeing that the good idea always comes. I mean you never go into that meeting empty handed. So you have to trust that that will happen and I'm going to guess it never didn't happen. Robin: 08:31 No, it always happened. Jim: 08:32 Somehow it always happened. Robin: 08:35 It always happens. It's just not really always orderly. Robin: 08:42 And it's not always convenient. Robin: 09:24 No we're clutch players. In the clutch something completely turns on and it's crazy. And maybe that's just experience or whatever. But I am a clutch player. I say to Jim if we could manufacture a series of five clutches a day, we would be millionaires. Honey: 09:41 Oh my god. Robin: 09:41 We would be rich because it's like bang. Jim: 09:44 It's that pressure that just like stuff comes and you don't know how. Jim: 09:49 And it does. And it's so much fun when it works. Robin: 09:52 It is really fun. And that's what I think our kids also saw is that creating things is really fun. My mom has said that Jim and I are never happier than when we're doing this work together. And I think that's true. We do like this work. We like work. We like to create. We like to create together. It's fun. And if that's the thing that the kids walk away from, that's great. That would be the best thing. Because in the end that's what motivates us. It would be nicer to make more money doing it but in the end what motivates us is that. Now we're at this place where the kids are gone. And it's interesting as we redefine our business because we said earlier we didn't really plan to have kids and really had no idea we were on a 20 year detour. But our business was part of the detour. If we wanted to make a lot of money, we would have left here and gone back to New York and LA. We would've at least gone down to some of the big agencies but we never did. And so now the kids are gone and that's great. They're off living their own lives and now we get back to look at ours. And it's interesting to look at our career after spending 20 years putting that second to our family. Or making sure that blended in. And so now is the time when we are doing a lot of thinking and talking about it because we never planned to really, we didn't realize we were putting our career and our business on a back burner. But we were. And now we're like okay what are we going to do now. What's on the bucket list? What didn't we accomplish? Who do we want to work with? What do we want to do? Honey: 11:34 Yeah what are you going to do now? Blaine: 11:38 That's going to embarrass your kids. Robin: 11:44 You know I think that we have been... I have been amazed at how much share of my brain, share of mind is freed up. Those kids, the time they took up all those 20 years is nothing compared to the share of my brain they had. Jim: 12:01 Well yeah. You think about it a lot. Yes. Robin: 12:04 So suddenly there's all this room to think. It's unbelievable. Jim: 12:11 It's a new lease on creative life. Jim: 12:18 We're still sort of formulating that. I think there's a transition period that's been taking place but it hasn't been happening really fast. Blaine: 12:27 Well understandable because you've spent so long being parents with a business and doing it here and it all of a sudden you've got an entirely new paradigm. Or more time for what you do. Robin: 12:42 A lot of the people I know who are couples in business are couples in business for the very same reasons that we were. It's not just the business. It's your whole life. You're trying to make 20 years work out the way you want them to. Blaine: 12:57 So here's a question that since we've been talking about the kids and they've seen everything, warts and all and maybe this happened, maybe it didn't. But it might be interesting to hear if it did happen and if it even impacted them. Was there ever a time when you were running Whitney Advertising that you said we can't do this anymore? Daily? Honey: 13:20 That time would be 5:00. Robin: 13:25 I think when the kids were there that didn't happen. Because we had, it was part of a whole. That included them and their needs and our goals. It was part of a whole. Now that the kids have gone, and we're empty nesters, they're off at college and it's all great, we're more likely to not be able to put the whole picture together and wonder why we're doing this this way. And because they were part of why we did it. This is like a therapy session we're having here. Our whole business was about them and now they're gone and so we're kind of like okay what are we doing and how do we make it whole again to work for us because we don't have to factor them in anymore. Now it's our business. It's our life. Honey: 14:25 So now that leads me to something I wanted to ask. So it's back to the two of you. So over the 20 years is there something that you learned about Jim that was maybe you didn't fully get but now that you worked with him for 20 years you're like wow that's an amazing Jim thing. Robin: 14:49 You know we started this conversation by talking about why our early meeting and after some ups and downs, I decided that I was absolutely going to take my relationship with Jim as far as I possibly could because I liked myself the best when I was with him. Honey: 15:20 You're killing me. Wow. Robin: 15:23 And that's never changed and so what I have realized about Jim through all of this is oh my gosh, what a great guy. He's always there with the right thing all the time. And he always makes me better. He always makes me better. Honey: 15:42 So Jim I have to ask you the same question. What's the most amazing thing about you, no over the years what was it about Robin that maybe just came to the surface where you're like Robin. Jim: 15:54 Well again when we first met and we were dating and I was sure that she was going to dump me at any second and get back to the rich guy, once we moved past that and we got to the point where we were really seriously together, my whole point of view then was there's no question that life will never be boring with Robin. And professionally through running the agencies just the true burst of pure brilliance that we'll be sitting in a meeting and it's going and Robin likes to have three hour meetings. But you know what, it's always at like two hours fifty minutes and then this moment occurs and this epiphany happens, particularly for the client where she finally gets the answers and just watching that is amazing. And it's fun and it's really gratifying to be able to get to that point with a client. Now, we're on the count down to see how many clients she can make them cry before the meeting is over. Blaine: 17:23 Oh we love doing that. Jim: 17:26 Because not out of.. they cry because it is like therapy. Jim: 17:31 It is like you're sitting in a therapy session and by the time they finally break it down and say this is what I want to do, this is why it hasn't been working in my business, not their personal life, but Robin says we're going to do this. And it's going to take you there. And they just start to, tears just start to roll. Just sit there and go oh my god. Look it worked again. Robin: 17:58 We're a really good pair personality wise to be in business together. I mean Jim has, I mean much more emotional intelligence than I do. He makes it all work. He puts it all together. It's true that I'm kind of the thoroughbred, the little orchid. There's moments I know I'm not always the right person to be running our business. But there's moments everyone needs a business where someone delivers that ten minutes of the best thing you've ever heard. Where the intellect shows up, or something happens where it's just amazing and people cry. And not everyone can work in that. I mean it's a good pairing. It's a good pairing because he keeps the drum beat going while I every once in a while show up with a Virtuoso. Jim: 19:09 That's a good analogy. Blaine: 19:11 All right. I don't know that we can make anything better than that happen so I'm going to ask a completely different kind of question here that's outside of what the advertising, what would you say to somebody who is thinking about doing this themselves, going into business with a spouse or significant other? Honey: 19:29 Don't do it. Jim: 19:37 Actually you know what the thing is that everybody always says how have you done that. How have you done this together for 20 years basically together all day long every day. The key is it goes back to what we were saying earlier is number one she's always had expertise and we both had our own careers in this industry together and we both had a great amount of respect for each other prior to being business partners. And so I think yeah, I think it would be really hard if you had let's say a guy, a woman or a man who was a day trader and the wife decides or the husband decides to sort of kick in and let's do this together. But I've never really worked in that field. There would always be a divide or a less experienced moment between us. We've both worked in agencies and had giant projects we were working on that were either greatly successful or not. But all that experience.. and the other thing I think is without question I think it's just respect. I have an immense amount of respect for Robin's capabilities professionally aside from our marriage or our relationship. And I think the vast majority of the time when we're at work we're really at work. And she is this job title and I am that job title. And no we don't agree with each other all the time. But if we're disagreeing, I think we do have an amazing ability to separate. I'm not disagreeing with my wife. I'm just disagreeing with my business partner. Respect. It's all about you have to have. Robin: 21:40 Well yes, you are immensely respectful to me and I cannot tell you how much I appreciate it. Over the course of 20 years in business we've had a bunch of husband and wife clients walk through our doors. And sit opposite us. And tell us about their businesses and the needs that they have and they want to hire us to help them with their marketing. And Jim is immensely respectful. We have sat there, I would say probably 20 or 30 couples have come in. Robin: 22:11 There have been times when we've walked out of the room and I have said to Jim if you ever spoke to me that way one time, this partnership would be over. I would walk right out the door and it would be done. And truly the couples that come with us who are starting business or trying to refresh a business most of the time that's exactly what we hear from them. So when they ask us how to make it work, in my experience the men are extraordinarily disrespectful of the women. And the fact that the women continue to be a part of that partnership in that business is really amazing. They're not using their resources as best they could and often just the tone of voice and the sharpness in those communications in front of us may be we wonder do they always talk like that in front of their employees. Is it because they think we're a husband wife team we're going to get it. That we talk that way to each other too. We never talk that way to each other. We never do. Honey: 23:23 I'm going to guess that yeah, that's how they speak to each other all the time because I think that the way you work together is similar at work is similar to the way you work together in your marriage. And if it's okay to be crummy to your spouse, it's okay to be crummy to them anytime. Robin: 23:46 Well so that's always interesting because we've seen it a lot. And it's sometimes these seem to be happy marriages and successful businesses and that's just the tone of voice, that's just how things are said. That's just how the communication works. But it's painful to hear. Blaine: 24:08 I can imagine. Robin: 24:09 And I'm sure you guys have heard it. I'm sure you guys have had couples come to you and you've heard conversations that you just left the room and went oh my gosh I'm so thankful for Jim because he is always a gentleman and always respectful of me. Honey: 24:28 I mean we've definitely left different encounters where Blaine will say we're the lucky ones and it usually means that we like each other. Jim: 24:40 Absolutely. I mean if you just read or even believe the statistics just about marriage, that however many marriages don't survive. Blaine: 24:54 They say 50% but I think there's also data that shows that's a flawed number. But just say it's true. Jim: 25:00 Let's say that's true. Honey: 25:01 It's a big number. Jim: 25:02 And then you say okay now you're going to go work together and spend every day together. You know what I think part of it too, it's hard enough to be married then let alone spend every day at work together. But I think that part of it is too that people always assume that we're literally in the same room together all say long talking to each other all day long. Part of the difficult part of it in terms of the client relationships is they will think oh well I mentioned to Robin the other day blah, blah, blah. So they assume that we've talked about that and we know all about that. But we can go a whole week easily with peripheral communication because I'll be really busy doing this and she'll be really busy doing that. And we might touch in and go okay I finished the thing on that so I'm moving on to the blank but there are times we go days. And when we do come home, we used to work from this house downstairs. And that was harder. But we do tend to come home and now we're at home. Honey: 26:14 Can you shut it off? Jim: 26:16 Not always no. It doesn't always work that way. But to a larger degree percentage of the time we come home, we'll have dinner, we'll talk about this, we'll look at the paper, and we'll talk about politics or we will actually attempt to sort of leave it at home. So we might not actually talk about that phone call you had with Tom for two or three days. Robin: 26:41 Telling one of us is not the same as telling the other. Honey: 26:45 How hard is it to get people to CC the both of you? Robin: 26:48 Sometimes they do have a hard time with that now that you mention it. Jim: 26:51 Oh yeah. And how to do that diplomatically. If you would just copy all it would be really really helpful. You don't want to assume that. Robin: 27:01 We sit far away from each other. Jim: 27:03 We're both getting that message. Robin: 27:04 We always have sat far away from each other. I can count on one hand the number of times in business that any of our clients have ever said to me refer to Jim as your husband. And because whenever they do that it's a shock and kind of an insult. A little bit of a slap in the face. Well I told your husband because I always think. First of all I think who? Because in 20 years of working together in front of our staff, our clients or anyone I have always called him Jim. I have never referred to him as my husband. Our staff does not do so. We're very separate people. And he is my husband. But it doesn't seem appropriate or productive or helpful or politically correct or anything to suddenly remind me that he's my husband. Blaine: 28:02 Never say that to a feminist. Robin: 28:05 There's always some other message in that. I told your husband that. Jim: 28:12 Well especially with that intonation. Robin: 28:16 But there is kind of that intonation to it. And no man has ever said it. It's only been women. Robin: 28:23 No man has ever referred to Jim as my husband. It's only been women clients who have because there's always something to it. I am a feminist as much as everyone says women are equal now. No we're not. The subtitles, the shadings the texture of it all, I'm in my 50s. I have had a great career. I've been in business with my husband for 20 years. Women are not equal to men. Robin: 28:55 And maybe to be in a couple co. You have to realize that because maybe you'll be fighting against something that you can never win if you aren't willing to accept that that's how it works. Jim: 29:10 You got to keep trying though. Blaine: 29:12 Wouldn't you know for the men on the converse side is the always super clever tongue and cheek is so why don't you run that by the boss and then let me know what you guys think. Honey: 29:25 That makes me insane. Robin: 29:27 Who says that? I don't want to know. Blaine: 29:32 Tell you run that by the boss, or you probably need to check in with the boss. Honey: 29:37 It's like a shopping joke. Jim: 29:39 Here's the thing. I actually mean it. I couldn't run this business without you in charge. Not possible. Blaine: 29:47 No me either. Robin: 29:48 Oh my gosh. Blaine: 29:52 We're going to do something here. We got the fearsome five for you. Blaine: 29:56 So Robin, what is Jim's biggest pet peeve about you? Robin: 30:03 Oh I cannot watch the clock during meetings and I let them go on way too long. Honey: 30:10 Jim, what is Robin's biggest pet peeve about you? Jim: 30:15 Probably that I'm... well a couple years ago I read a quote by Mark Zuckerberg that said done is better than perfect. Jim: 30:25 And I really took that to heart because we've been very busy and done is better than perfect. Makes her crazy. Blaine: 30:35 All right Robin, what do you do just to annoy Jim? Honey: 30:38 Do you do anything that you know will get under his skin just to get a rise? Robin: 30:43 I really don't think so. Do you think I do anything to annoy you? Robin: 30:49 I mean I don't know because. Robin: 30:56 But I don't really ever want to annoy Jim. That would be a very very counterproductive thing to do in my whole life. Blaine: 31:05 Not even for sport? Jim: 31:08 I don't know that I, do you think I do? Robin: 31:09 No I don't think you do. I don't think we do anything to try too push each others buttons. Blaine: 31:14 Maybe that's part of the secret. Robin: 31:15 I don't think we push each others buttons. Jim and I are in business together every day. We have our lives our completely meshed in every way. I know I'm going to annoy him various times unintentionally and so I would really never intentionally try to add to that. Honey: 31:31 Fair enough. If you could pick from anybody, doesn't matter alive or dead, you could pick a third person to add to this business union. Who would you pick? Jim: 31:45 Alive or dead? Honey: 31:50 Oh. Fair enough. Blaine: 31:53 All right. Robin, since working together what has been the best date night ever? Jim: 32:00 You can say they've all been brilliant. Robin: 32:02 Gosh, since working together. Do you know we've had some really fun times that have felt like we were back dating in New York again when we've been out of town on the east coast. And it felt just like we were back when we just started out. And it's been part of advertising and travel and just being together that's been pretty great. Now that we're empty nesters, it's remarkable how. Jim: 32:33 Yeah we just had a martini party on Friday. Robin: 32:35 But it's remarkable how much we've gone back to those days when we were 26. Blaine: 32:41 I think I remember that martini party. Jim, same question for you. Jim: 32:48 Probably yes on a business trip. But yeah, there is something about being in the city when we've either had to travel to Boston or New York. After the meetings are over and it's not necessarily a date, it's just we have a tendency to really at two o'clock in the morning we find ourselves wandering around back streets. Robin: 33:12 Oh my god remember when we found the bunny at two in the morning. Jim: 33:18 And we literally just walk around in a drizzle and it's just not wanting to go back to the hotel and not wanting to go back to go to sleep. Robin: 33:33 We've always been night wanderers. Robin: 33:36 Always. We've always been night wanderers. We wander around deep into the night. Robin: 33:40 In cities and Paris and London and Oxford, and always. Always. Blaine: 33:47 All right, Robin, what's Jim's best quality? Robin: 33:51 Oh he is so kind. Honey: 33:54 Jim, what's Robin's best quality? Jim: 33:57 Absolutely brilliant brilliantly smart and funny. Honey: 34:05 Yeah, you win. All right. Here's where we wrap it up and thank you guys profusely for sharing all of that. Robin: 34:13 Was this going to be a good show? Blaine: 34:14 This is going to be three good shows. Honey: 34:16 I think I'm going to listen to it five times at home. Blaine: 34:18 Beyond the half hour. Robin: 34:19 Did we have any good advice? I guess we did. Honey: 34:21 You did. You had amazing advice. Robin: 34:22 Don't learn each others areas of expertise. Honey: 34:26 Don't learn each others areas of expertise, respect the other person, wait until you're on equal footing to start a business together. I mean those are three really great things. Robin: 34:38 It's true. I would also say truly if your husband is in any way a chauvinist jerk and unkind, don't do it. I mean part of couple co. Should be simply a message to women. Blaine: 34:38 Don't go into business together. Robin: 34:51 It's not men who should worry about going into business with their wives. It's women. Honey: 34:56 And I wonder. Robin: 34:57 Who should worry about going into business with their husbands. Honey: 34:59 I wonder what the younger generation it it's the same thing. But certainly. Blaine: 35:05 Well you have to hope. Jim: 35:05 I wonder every day how she does it. Blaine: 35:07 We have to hope that the younger, that men are evolving. I men we have to hope that a 23 year old man today isn't like what we know as the 75 year old man of our youth. I mean we have to hope. Jim: 35:26 I imagine the man in the gray flannel suit going into business with his wife. Blaine: 35:32 Oh not going to happen. I mean you guys watched Mad Men, right? Jim: 35:35 Well I did. Honey: 35:36 I couldn't. It was too close to home. Jim: 35:37 It would make me crazy nervous all the time. Honey: 35:41 Yes, I would just start to solve the problem. Jim: 35:43 My presentation would be so uptight by the time that episode was over. Honey: 35:46 Oh my god. I couldn't do it. Jim: 35:47 I only really like the episodes when his new wife was singing Ju Ju. But yeah, those guys in Mad Men they were never going to go into business with their wives because their wives were just ornaments. Robin: 36:08 Well here's the thing about couple co. Is the danger to the woman. And if the woman is really competent and able to be an equal partner but she's married to a guy who's not trying to be a chauvinistic jerk. He just is because it's part of his DNA. She's going to find more success in business without her couple co. With other women. And is that why women are starting businesses and the mom and pop business is starting to go away. Whenever we're in these meetings and there's a really bad situation between the husband and wife, it's usually not the wife who's saying the mean stuff. It's usually the guy. Jim: 36:45 Not usually. Sometimes. Robin: 36:46 Sometimes. But not usually. And so you wonder what could that woman accomplish if she really was putting her know how to use without being part of this couple. Honey: 36:58 I mean you never know. I mean you never know no matter who's being put down, what are they getting out of it. Which is more psychology. Robin: 37:10 Jim, are we done? Honey: 37:13 You guys were great. Blaine: 37:16 And this concludes part two of the Whitney interview. If you missed part one, it's available on iTunes. In the mean time if you've enjoyed this podcast and you think it would be useful. In the meantime if you've enjoyed this. Why don't you say this part? I obviously can't. Honey: 37:29 In the meantime, if you enjoyed this podcast and you think it might be useful or fun for other couple entrepreneurs please go to iTunes and leave a star rating and a review to help them find it. Blaine: 37:40 So join us next time for a trip into a Napa Valley wine cave with Ryan and Crystal Wah of Wah Cellars. That's next time here on Couple Co. Working with your spouse for fun and profit. Honey: 37:52 For more information on Couple Co. Visit Coupleco.com. Blaine: 37:55 This show is copyright 2018. All rights reserved. Honey: 37:59 Love you baby. Blaine: 38:00 Love you too.